SAN DIEGO--(BUSINESS WIRE)--XIFIN, Inc. today unveiled VisualStrata, the only precision medicine informatics platform that curates and visualizes diagnostic, clinical and financial data to document the patient journey through diagnosis, treatment and outcomes. By uniquely collating structured and unstructured data from disparate systems into a single source, healthcare professionals gain deeper insights into optimal disease treatments and drive personalized care decisions. VisualStrata also supports strategic organizational objectives such as clinical improvement initiatives, efficiency programs, physician engagement and population health efforts. Precision medicine (PM) programs have the potential to decrease adverse events and provide better outcomes at a lower cost by tailoring therapies based on individual patient characteristics. A major challenge to the efficient delivery of PM is that patient data often resides in multiple data systems. This problem will only increase as more and more data becomes available, which is estimated to be growing at a rate of 48% per year.1 To optimize patient care, healthcare providers must consider all relevant patient data, which can be particularly problematic in oncology due to the complexity of the disease and the number of medical specialties often required for diagnosis, staging and treatment planning. Yet, according to a recent survey, 65% of physicians said they did not have all the healthcare information they need about their patients.2 Therefore, having access to enabling technologies that include sophisticated analytics and visualization capabilities is a critical success factor today. Developed to help meet this need, cloud-native VisualStrata helps care teams optimize patient care, support physician collaboration as well as develop healthcare quality reports and conduct research. Real-World Data Analytics – The consolidation of rich patient data sets from multiple sources allows for the development of real-world evidence (RWE), which can be used to establish clinical utility and lead to new disease treatment insights. VisualStrata’s ability to query patient data sets helps providers and researchers discover new insights for optimal treatment planning, precision medicine programs and population health initiatives. Healthcare Quality Reporting – As healthcare costs continue to rise and reimbursement is increasingly value-based, healthcare providers must document quality care activities that lead to improved patient outcomes and lower costs. VisualStrata has quality reporting capabilities that can help satisfy the evidentiary and compliance needs for both payors and institutions. Temporal Record and Case Management – Healthcare providers must be able to accurately organize, manage and document each patient’s journey – through diagnosis and treatment to outcomes. VisualStrata collates structured and unstructured data from disparate systems into a single source to enhance the functionality of EMRs and EHRs. Care Team Collaboration – Data-informed treatment planning is central to precision medicine, and clinicians rely on the expertise of their multidisciplinary team (MDT) colleagues to navigate the complexities of biomarker data, molecular testing and other diagnostics. VisualStrata’s collaboration dashboard allows care team members to share patient data and collaborate on cases in real-time and on demand. XIFIN, in partnership with the Journal of Precision Medicine, is launching a study exploring current thinking about precision medicine informatics approaches and best practices including data accessibility and use. We invite professionals responsible for healthcare data technology, strategy or management, as well as precision medicine professionals, oncologists, pathologists and radiologists who have insight on care team collaboration and quality reporting, to participate in this important study. Complete the survey today: www.xifin.com/pmisurvey. For additional information on the value of precision medicine and how VisualStrata helps break down data silos, visit https://www.visualstrata.com or booth #222 at the Precision Medicine World Conference (PMWC) being held at the Santa Clara Convention Center January 20-23, 2019. To learn more about collecting and using quality healthcare data in precision medicine, please attend the panel discussion at PMWC entitled, “Data Sharing, Regulatory Compliance and Reimbursement,” led by Patricia Goede, vice president, clinical informatics, XIFIN, on Wednesday, January 23, 2019 from 1:30 PM – 2:00 PM PT. XIFIN is a health information technology company that leverages diagnostic information to improve the quality and economics of healthcare. The company's cloud-based technology facilitates connectivity and workflow automation for accessing and sharing clinical and financial diagnostic data, linking healthcare stakeholders in the delivery and reimbursement of care. To learn more, visit www.XIFIN.com, follow XIFIN on Twitter and LinkedIn, or subscribe to the XIFIN blog. 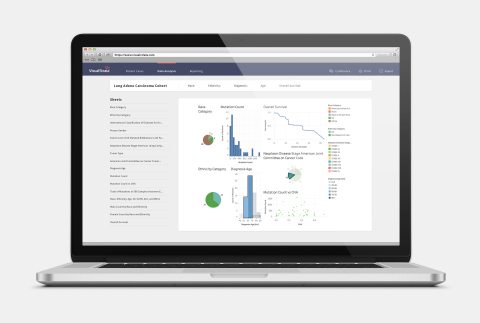 XIFIN unveiled VisualStrata, the only precision medicine informatics platform that curates and visualizes diagnostic, clinical and financial data.